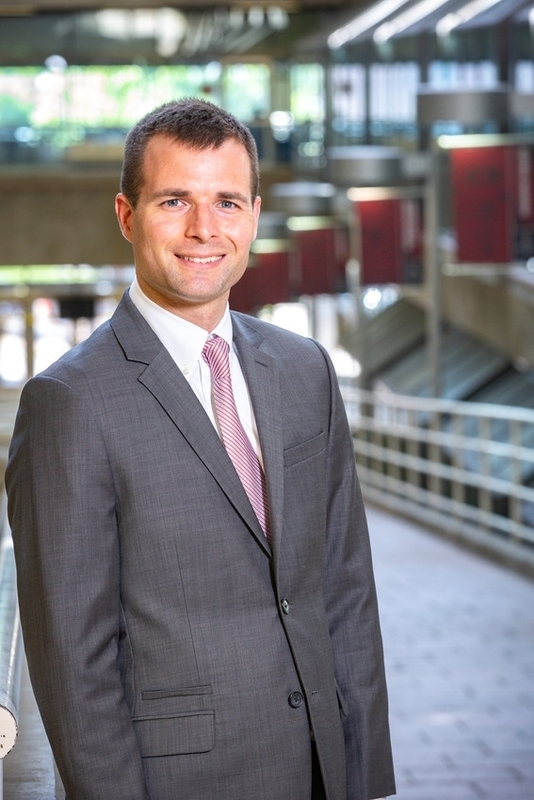 Kelly Sullivan, assistant professor of industrial engineering, is a third-generation University of Arkansas engineer and recent recipient of the National Science Foundation's prestigious CAREER award. His research focuses on optimizing wireless sensor networks. Editor's note: This feature is the third in a series highlighting the College of Engineering's 2018 Faculty Early Career Development Program winners. Industrial engineering assistant professor Kelly Sullivan was having quite a week. On Friday, April 27, Sullivan and his wife welcomed their second child into the world, a healthy baby boy. That Monday, April 30, Sullivan received word from the National Science Foundation he'd received the organization's most prestigious grant for young faculty members. It's a weekend Sullivan said he'll never forget. "In the same week, I experienced one my life's most significant events and one of my career's most significant events," he said. The Faculty Early Career Development Program is the described by the NSF as the "most prestigious awards in support of early-career faculty who have the potential to serve as academic role models in research and education and to lead advances in the mission of their department or organization." The funding amount is $500,000 over five years. 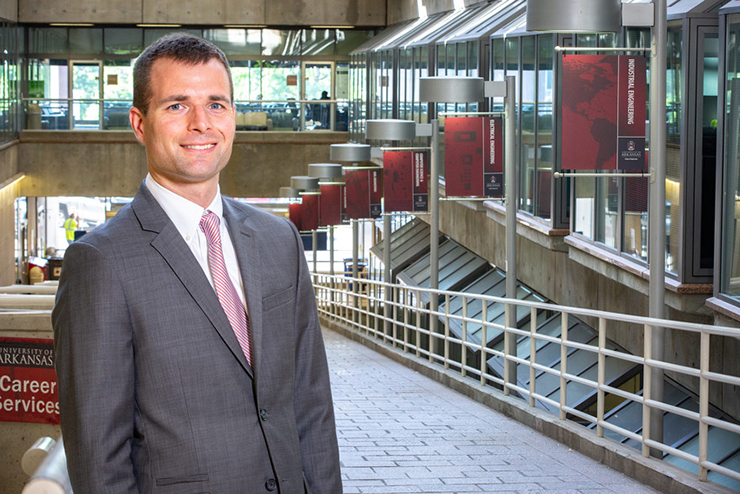 For Sullivan, who is a third-generation University of Arkansas engineering graduate, the CAREER award means an opportunity to dive deeply into a subject he's passionate about. Sullivan's research focuses on wireless ad hoc sensor networks, and the applications are about as wide as any research can be. Anything that can be tracked with a sensor that reports back to a central system falls within the scope. That includes devices that track forest fires, observe changes in ecosystems, and detect terrorist threats, such as biological, chemical and nuclear attacks. Sullivan's CAREER award research is focused on making sure those networks operate efficiently and reliably over time for the companies, governments and other organizations that rely on them. "Sensors observe the environment and transmit back activity," Sullivan said. "Sensors can be expensive and prone to failure over time. That's where the importance of network reliability comes in." Research into sensor network reliability isn't new, but Sullivan's proposal is because it views the network as a system that can be reconfigured over time. The most common metric engineers use to measure sensor network reliability neglects the engineer's ability to make changes to the network as it degrades, Sullivan said. "My thought is that the network can still serve some, albeit reduced, function, even after some number of sensor failures," he said. "This raises questions about how the initial network should be designed, and what actions should be taken to ensure the network remains in good health over time. For instance, after a number of sensor failures, it may make sense to deploy new sensors into the network in order to restore its functionality." For Sullivan's purposes, he'll focus on failures caused by sources that are mostly random in nature. "We need to be able to describe and analyze reliability in that new sense. And once we can describe it, the question becomes 'can we optimize it.'" The problem, Sullivan said, is there are major mathematical and computational hurdles to understanding how the network will evolve over time as sensors fail. Dealing with random, evolving networks will require advancing and merging cutting-edge computational and mathematical methodologies. "We need to be able to describe and analyze reliability in that new sense," he said. "And once we can describe it, the question becomes 'can we optimize it?'" Optimizing a network, whether it's a group of earthquake sensors or a system for detecting smuggled nuclear material, means taking into account a few factors. Cost is key to helping a network move from concept to execution, but reliability is equally important. A cheap network that breaks immediately is useless. However, a network with several backups may be too expensive to be practical. Sullivan's research aims to equip engineers to design cost- and reliability-efficient networks. By managing the network actively as the network evolves, it may be possible to improve reliability and reduce costs throughout the entire life of the sensor network. Sullivan's journey to the CAREER award began at North Little Rock High School. Like many high school students, Sullivan was unsure what he would study in college. Then, he said, he met a recruiter from the University of Arkansas Industrial Engineering Department. "After listening to the recruiter's presentation in my calculus class, I said 'that looks like fun,' and the rest is history, I guess," Sullivan said. But the history extends beyond that in the Sullivan family. Sullivan was the third generation in his family to enroll in the University of Arkansas College of Engineering. His grandfather graduated with a degree in agricultural engineering, and his father graduated from the civil engineering department. Sullivan enrolled at the Fayetteville campus as an undergraduate honors student in 2003 and ultimately completed his master's at the U of A in 2008. His doctoral studies took him to the University of Florida, where he said he began the research that ultimately led to his CAREER award. "I've been in industrial engineering all along," Sullivan said, "but there's been an evolution of interest. I've always been interested in networks, collections of objects and the connections between them." His work at Florida focused on protecting networks from outside attacks. This was a natural field of study for Sullivan, who has long been a fan of board games. "Board games are about making decisions under competition, and that's what this kind of network optimization is about," Sullivan said. "You're weighing tradeoffs and making decisions while also anticipating the actions and reactions of another party." An honors student himself during his time at the University of Arkansas, Sullivan's CAREER award also includes plans for two new honors courses in the College of Engineering. "Being an honors student here was a major reason why I pursued a Ph.D. ... You have a much more in-depth, personalized experience." Sullivan said he chose to focus on honors curriculum because of the experiences he had as an undergrad. "Being an honors student here was a major reason why I pursued a Ph.D.," Sullivan said. "It's your first experience into the research process, and you have a much more in-depth, personalized experience." The first course in Sullivan's proposal is a sophomore-level seminar course that equips students to identify a research topic and faculty mentor. The course brings together students from different disciplines to learn about the research process and gain exposure to interdisciplinary research topics. The second is a junior-level course in which students will write research proposals seeking real funding. Sullivan said the course plans to target the Student Undergraduate Research Fellowship, or SURF, as well as funding from the University of Arkansas Honors College. A similar program within the industrial engineering department has resulted in an increase in successful grant applications, something Sullivan said he hopes to see college-wide. For Sullivan, a third-generation University of Arkansas engineer, second-time dad and now a CAREER award winner, the experience has been a whirlwind. "It's really exciting," he said. "It's an honor. More than that, it's a great opportunity to do the research I really want to do, pushing boundaries and taking this work in a new direction."